Design your C# and XAML to respond appropriately when the orientation changes. The basic question comes down to this: what will your app do when the user rotates their device? There are two options. Everything magically looks good in portrait and landscape mode. If you've carefully (or luckily) set up your app's controls to be contained within a XAML grid, you might find your work is done. If you're using a GridView or Hub control to manage your app, this is often the case. Congratulations! Sometimes an app with a less standard layout might not look so great when the orientation changes. If your app really can't work in multiple orientations, you might want to lock it to a specific format by setting the preferred orientations in the Package.appxmanifest file. Clearly this is not ideal, but if the design is fixed, it might be your only choice. Let's assume, though, that you do want to support both orientations. Where do you start? This is analogous to the iOS message didRotateFromInterfaceOrientation. If you want, you can programmatically shuffle around various controls to suit the screen orientation at this point, but as we've seen in Building your app with XAML: the Grid, it's usually better to let XAML reposition the controls. So what do we do instead? Unfortunately this approach doesn't work if you want to use the same control in the two orientations, but with some properties altered. You cannot have two buttons with the same name, and then hide one and reveal the other, because you cannot define two objects with the same name. You can however use one control and change its properties (say the color, or the height and width) programmatically, in the Current_SizeChanged method mentioned previously. 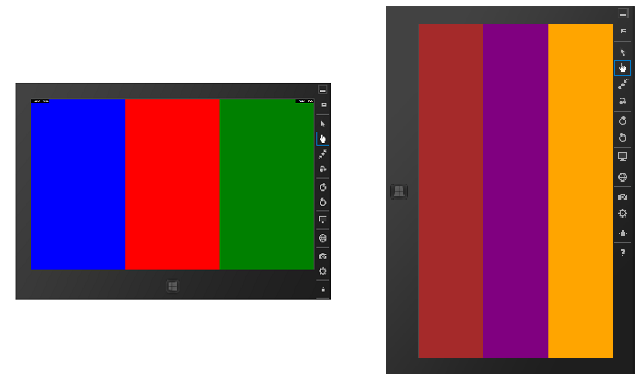 You can also achieve this without writing code using the XAML Visual State Manager. The Visual State Manager can change properties (say, color) depending on a specific "state name" (which you provide). In our example, the state name is literally "Landscape" or "Portrait". The downside to using the Visual State Manager is that your XAML quickly gets very large, with duplicated declarations, and so it's a good idea to have everything working in one orientation before trying to get it working in both! Here's an example that shows how to use the Visual State Manager. 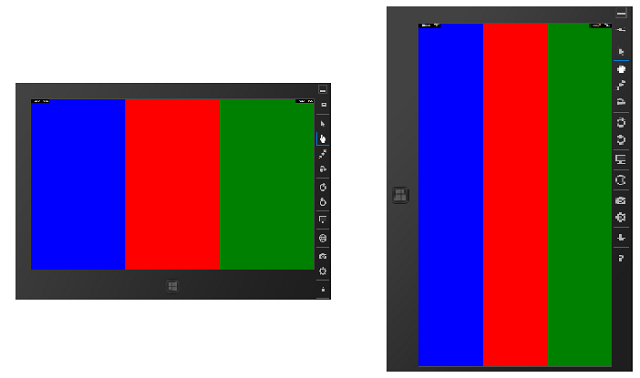 First, the before case: a simple piece of XAML that draws three columns across the screen, in blue, red and green. Now, let's say we'd rather have different colors when the view was rotated. That's were the Visual State Manager comes in. First, we add a line of code to the method to trigger the Visual State Manager. This code sends "Portrait" or "Landscape" to the Visual State Manager. Now we update the XAML in our page. The same three columns are still there, but we also define two Visual States. The first, for landscape mode, is empty because this is the default. The second, for portrait mode, is where the changes happen and here we use Storyboard animations to change the color properties.